Hey Everyone! For this week’s Slow Cooker Sunday I am bringing you a stew that those of you who are sensitive to spiciness may find too spicy and those of you on the other end of the spectrum will say “Where’s the spice?” I’m on the latter side of that statement. I truthfully didn’t think the stew had any kick to it but others who tried it did, but, not so much that they weren’t able to enjoy it. So, what is this stew? Well, it’s a Chicken and Hominy Stew. 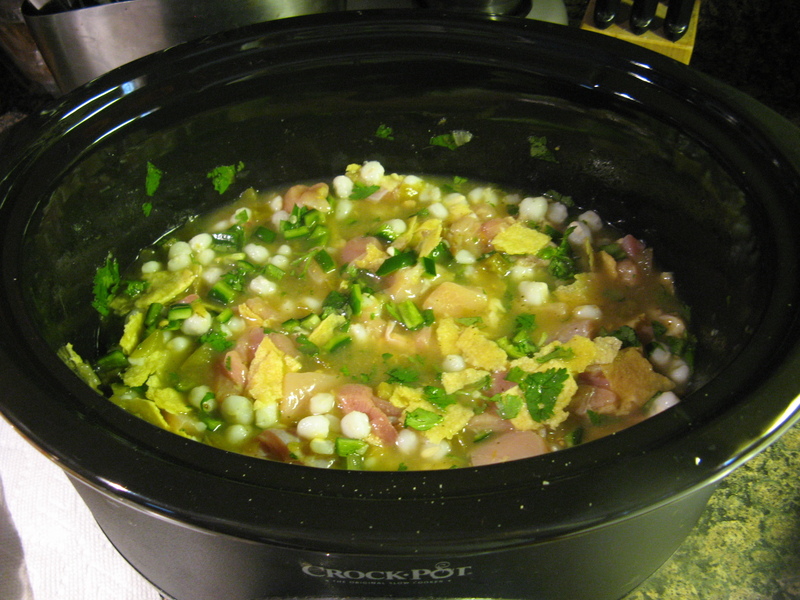 Once again, this is another of my favorite types of slow cooker meals… Just chop, drain then add to the slow cooker and let the machine work its magic. After cutting boneless skinless chicken thighs into approximately 1-inch pieces I placed them in the bottom of my slow cooker. Next I added in 2 seeded and chopped poblano chile peppers, half a bunch of cilantro that I roughly chopped and two cans of hominy that I rinsed and drained. 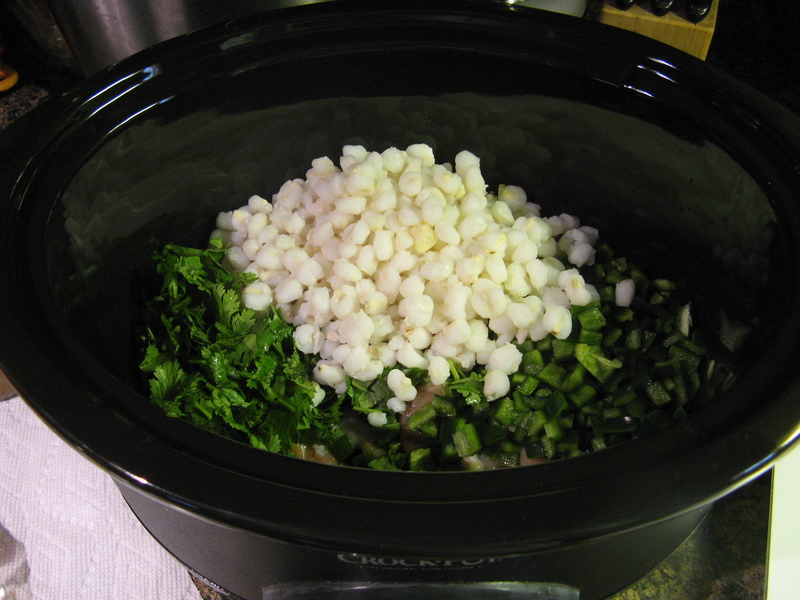 If you are wondering what exactly is hominy check out this link. 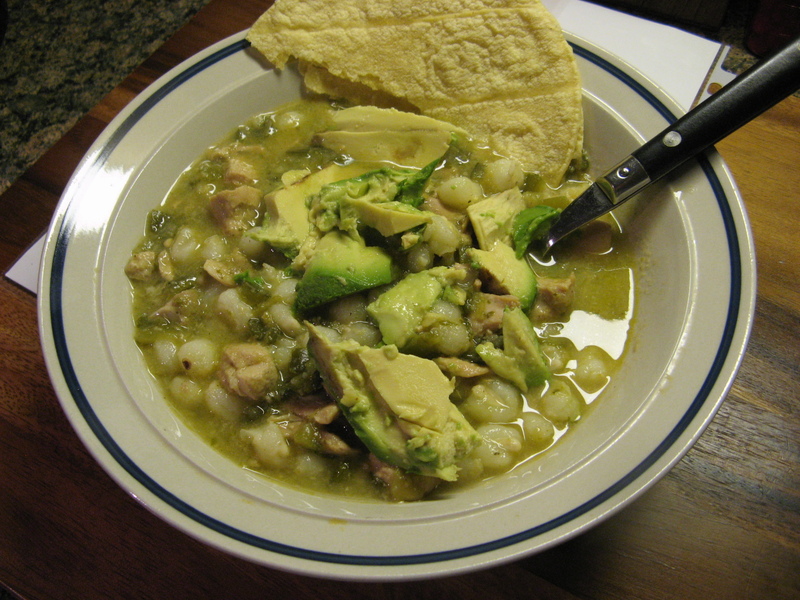 I then added in my liquids… low-sodium chicken broth and a jar of mild salsa verde. And finally I added in two corn tortillas that I tore into small pieces. I then covered it and set it to cook on low for 7 hours. Now, if you have a programmable slow cooker you need not worry about your start time, but, if you have a slow cooker like mine – I have one that has a 4 and 6 hour cook setting for high and a 8 and 10 hour cook setting for low, and a separate warm setting – make sure you take note of your start time. You don’t want to “overcook” the soup and end up with chicken that’s on the verge of shredding. You want a bit of bite to this soup since it is a stew. And after 7 hours it was time to enjoy a bowl. I topped it with some chopped avocado and enjoyed it with an extra corn tortilla on the side. Overall there’s not one thing about this stew I would change. The flavors all worked well together and like I said earlier I definitely didn’t feel like it was too spicy, it was just right! 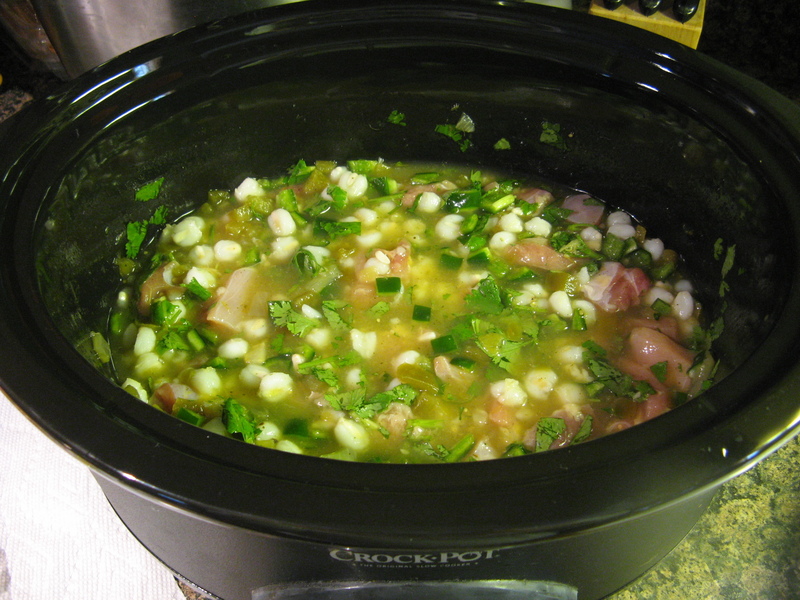 Add the chicken, hominy, peppers and cilantro to the slow cooker. Add the broth, salsa verde and salt and stir to combine. Next, tear the 2 corn tortillas into small pieces and add to the slow cooker. Give everything a good stir, cover and cook on low for 7 hours. If serving with the tortillas, warm them according to the package directions. Top each serving of the stew with your favorite topping and enjoy. Serve with the warmed tortillas on the side. *Please note I use a 5 1/2-quart slow cooker.